Yachting has an image problem. When you think of big old sailboats you mostly imagine rich leathery men in boat shoes who smoke big cigars and try to hit rare pink dolphins in the head with with their keel. Antlos, a new boat and skipper hiring service, aims to change that. The service, based out of Venice, Italy, offers all-inclusive boat trips around various vacation hotspots including Italy, Greece and Spain. You can rent a fully-equipped boat with a skipper for about a hundred dollars per person a night, a fairly expensive proposition unless you consider you’re paying an experienced yachtsman to sail you up and down some of the most beautiful coastlines in the world without smacking into those aforementioned pink dolphins. “Antlos is a peer-to-peer marketplace where travelers can book all inclusive boat holidays directly from trusted skippers. It makes yachting accessible and affordable to anyone, including those who have never sailed before,” said co-founder Michelangelo Ravagnan. Founded by Nicola Peduzzi, Ravagnan, and Marco Signori, the Venetian company is different from competitors in that it doesn’t offer charters or self-piloting opportunities. 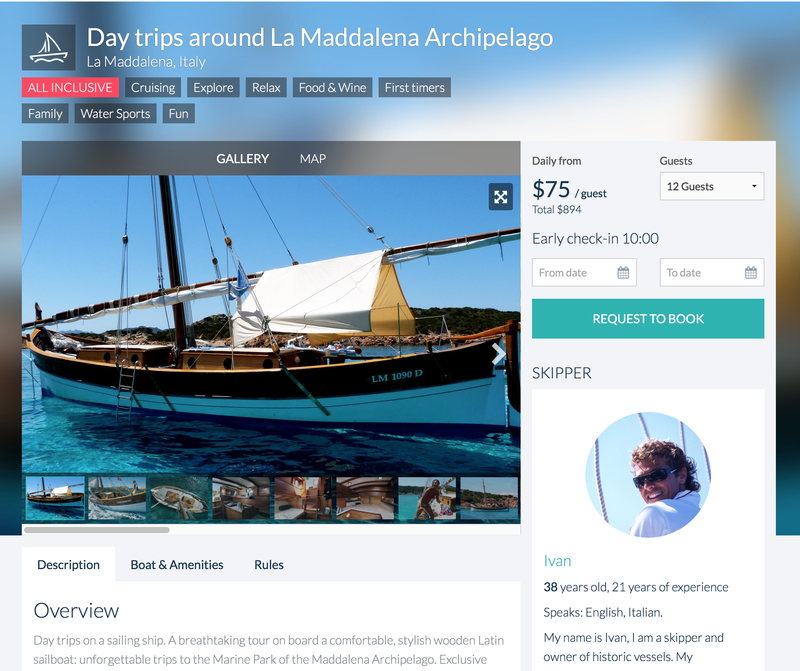 Instead you work directly with skippers to plan your itinerary and the company takes a cut of the transaction. They have just completed a 500,000 euro investment to grow the company and they’ve seen nearly a hundred (arguably premium) transactions move through their service in two months. In other words, this is less an Airbnb and more like an Uber. You work with the skipper to set up your trip and then you and your friends can pay them via a special “split pay” service that cuts the price into manageable chunks. Boats range from about $200 per person per day for an all-inclusive experience with food and about $72 for a smaller boat without vittles. The boats are no leaky tubs, either. One skipper pilots a handsome wooden Leudo with two bathrooms and others have four cabin pleasure boats with showers and kitchens. In short you won’t have to give up many creature comforts while you ply the ocean waves. While sailing isn’t for everyone, the service does democratize things a bit. Because you don’t have to do much more than sit back and drink a little vermouth while the skipper handles the engine and sails, the service makes for a nice vacation. If Antlos can pull yachting out of the desiccated clutches of traditional boat owners, they may have a winner on their hands.